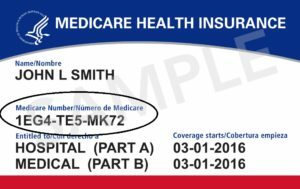 MEDICARE is ringing in the New Year with a gift to enrollees – between April 2018 and April 2019, each Medicare enrollee will receive a new Medicare Card. You might think that this is more of a pain than a present, but … you would be mistaken! Your current Medicare card contains your social security number (“SSN”). There it is – your SSN – in plain view for all to see! In order to combat fraud and identify theft, a new law requires that SSNs be replaced by a unique Medicare Beneficiary Identifier (“MBI”) for use by the Centers for Medicare and Medicaid, health care providers and enrollees for submitting and processing Medicare claims and other transactions. Below is a sample of the new card.